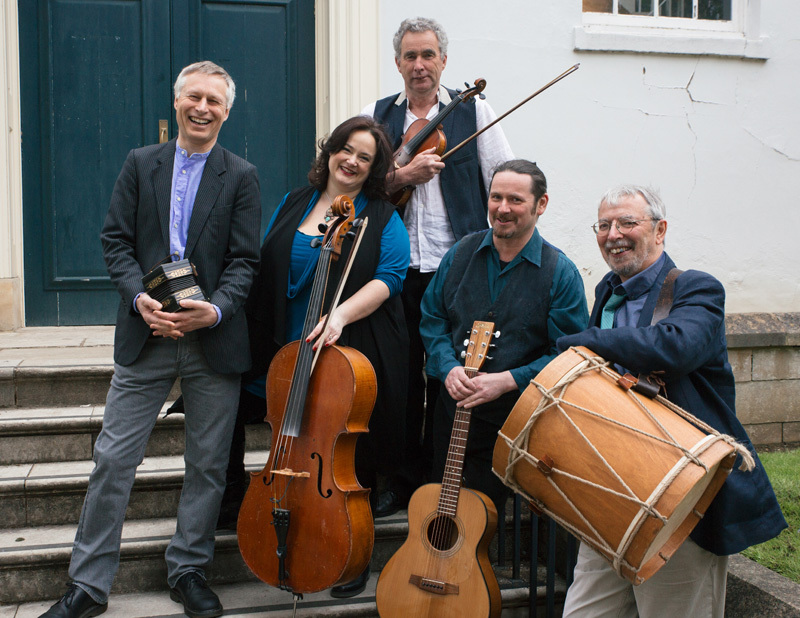 Magpie Lane is a five-piece folk band from Oxford, specialising in traditional English songs and dance tunes. The band has been delighting audiences for over 25 years - and through 10 critically-acclaimed albums - with a combination of powerful vocals and vigorous dance tunes, performing inventive arrangements on acoustic instruments. The fact that each member is not only a fine singer but also an instrumentalist in many ways makes the band quite unique. We have been scratching our heads trying to think of another English act which is able to offer the same standard of performance! 2018 was the band's 25th anniversary year which culminated with the release of 'The 25th' the band's tenth studio album. If you want a demonstration of just how vibrant and alive and feelgood English music can be, conveying the Spirit Of The Dance while maintaining a firm and respectful grip on the traditions it upholds, then you need look no further than this exhilarating disc." This followed 'The Robber Bird' (2011), the first release on the band's own label. Prior to that the band had released seven CDs on the Beautiful Jo record label - see Recordings for a full discography. All of their recordings have been well-received by critics and fans alike, and the band are a popular attraction in concert, and at folk clubs and festivals. Thanks for another great evening. Every time Magpie Lane appear at Ringwood Folk club we are near to capacity, with plenty of great singing from you and the audience. It's really good to hear proper Southern English Traditional music played so well. The musicians of Magpie Lane first came together in the winter of 1992-93 to record 'The Oxford Ramble', a collection of songs and tunes from, or about, Oxfordshire. Although originally conceived as a one-off recording project the band soon took on a life of its own. The success of 'The Oxford Ramble' led to the release of a second CD, 'Speed the Plough', a year later; to be followed shortly afterwards by 'Wassail: a Country Christmas' and 'Jack-in-the-Green'. The celebration of beer in song 'A Taste of Ale' was commissioned by highly respected author and folksong scholar Roy Palmer, to accompany his book of the same name, and was the first to feature new recruit Benji Kirkpatrick. Next came 'Six for Gold' with Sophie Polhill and Marguerite Hutchinson in the line-up, alongside Benji, and original members Ian Giles, Mat Green and Andy Turner. The seventh Magpie Lane album, 'Knock at the Knocker, Ring at the Bell', was the first to feature Jon Fletcher. This was another seasonal collection featuring songs and tunes from the band's Christmas shows. Immediately after the release of 'The Oxford Ramble', a series of promotional concerts in and around Oxford proved immensely enjoyable - for band and audience alike - and confirmed Magpie Lane very much as a live band, as well as a recording outfit. Since then Magpie Lane have built up a loyal following: in particular, the bands regular Christmas concerts at the Holywell Music Rooms have become something of a tradition on the Oxford music scene, and have frequently sold out. Magpie Lane have also made successful appearances at festivals including Sidmouth, Towersey, Fylde and Chippenham. At Sidmouth '99 the band provided music for the highly successful Arena Theatre show Flashback, which celebrated the meeting in 1899 of Cecil Sharp and William Kimber, and the continuing revival of morris dance in England. The sound of Magpie Lane is unmistakably English. The groups repertoire originally focused exclusively on Oxfordshire. Although a concert set might now include the occasional item from Ireland, the Isle of Man or even France - as well as a few recently-composed pieces - English traditional songs and dance tunes remain at the core. When mixing 'The Oxford Ramble' Ashley Hutchings happened to be in the Woodworm Studio. On hearing the Swalcliffe May Day Carol he commented "You can tell it's English a mile away". We think he meant this as a compliment; we certainly took it as such! The bands instrumental line-up was originally based around that of a nineteenth century village band, with fiddle, cello, concertina, whistles and percussion very much to the fore. However Magpie Lane has always preferred to remain true to the spirit of the tradition, rather than slavishly reproduce an "authentic" sound. Thus the band has always made use of the eclectic range of instruments at its disposal - and over the years bouzouki and guitar have rubbed shoulders with melodeon, autoharp, hurdy-gurdy, smallpipes, recorders, flute, harmonium, viola and Appalachian dulcimer. The groups instrumental prowess is matched, if not surpassed, by its vocal strength. Fronted by the wonderful voice of Ian Giles, all the members of Magpie Lane can in fact sing, and powerful vocal harmonies are one of the bands trademarks. There can be few bands blessed with such fine singers, subtlety of accompaniment, rich mixing of diverse instrumental tones. Individually and collectively the band have so much talent and whichever combination of voices and instruments were blended together, they all sounded really beautiful. There was an interesting variety in what they offered and each song and tune was a musical gem in its own right.